A Gloucester, Mass.-based sportfishing boat hooked, tagged and released a juvenile great white shark Saturday while trolling along Stellwagen Bank for bluefin tuna. But state officials took steps Monday to assure the public there was no reason not to go to the beach and swim. 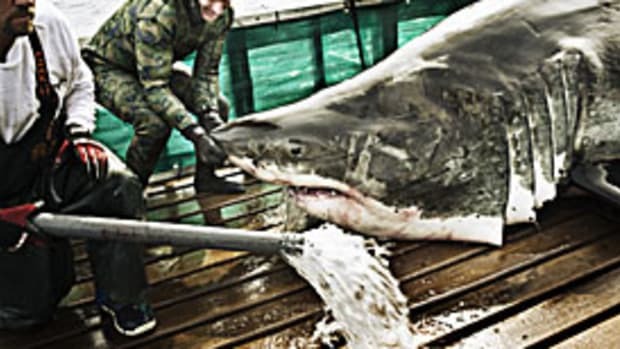 By great-white standards, the estimated 7-foot fish was small, but it set off excitement because of the idea of great whites rampaging through the shallows of summer beaches eating men, women and children - a common cultural reference spawned in part by the classic 1975 film thriller "Jaws."